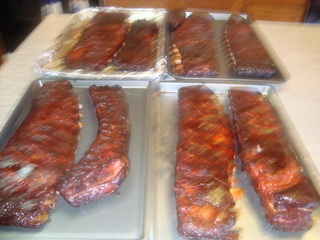 This cook was done on my Ranch Kettle and consisted of a mixed bag of pork ribs. I had two of those great big Kroger “Bronto” spare ribs which I cut down to a St. Louis cut, one slab of loin backs, two slabs of St. Louis cut spares and to make this a full cook, one slab of 2.25 and down St. Louis cut spare ribs out of a new case I just purchased a couple of days ago. This is a total of 8 pieces which did include those rather large rib tip scraps from the Bronto ribs. 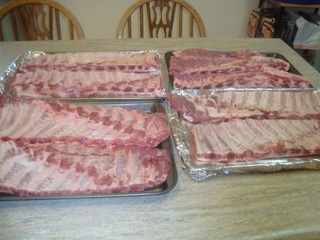 I prepped the ribs and then sprinkled on a generous amount of Smokin’ Guns Hot and then some Cimarron Doc’s rub. 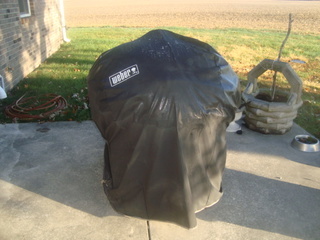 Rolled the kettle out and got the covers off and then prepped it for a big rib cook. I used four of the Weber charcoal rails or fences on two side of the cooker as this setup will give me a very even cook as I don’t like to have to more my meat all around the grill to get even cooking. I then added a half chimney of cold Stubb’s briquets to each side of the cooker. I added two full size pans and poured in a little over a cup of water to each to help prevent any drippings from burning. Placed the cooking grid back on the cooker and fired it up with about a 1/3 chimney of hot charcoal to each side of the cooker. 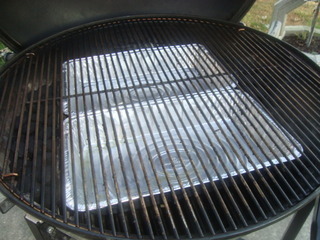 I then added a couple chunks of hickory to each side of my fire and I was ready for the ribs. Loaded my meat and started the cook. Ran the kettle with the top vent wide open and just used one of the lower vents to control my temperature. 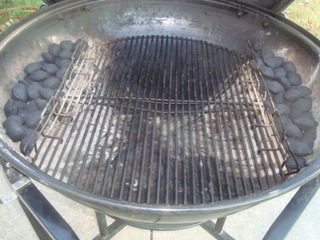 Got it dialed in at about 250 degrees measured on the cooking grid. At about three hours into the cook, I wrapped my ribs with some goodies which included a little apple juice, some agave syrup, some clover honey, and some brown sugar. I am trying to keep the calories down on this cook! With this mixed bag of ribs and the different thicknesses, I didn’t expect all of them to get done at the same time and they didn’t. 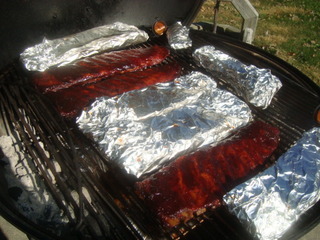 I had ribs in the foil, ribs out of the foil and getting glazed all at the same time on the cooker. Kinda kept the old fellow pretty busy at the end of the cook. My ribs just off the kettle. 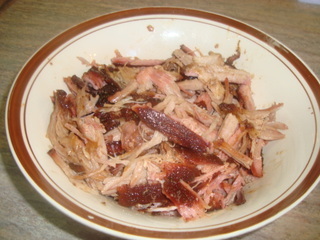 Pulled rib meat from the rib tips from my Bronto spares. This is my treat from this cook as it is my favorite with some cole slaw on a sandwich. I sure enjoy cooking on the Ranch Kettle. Outstanding Dave!!!! That grill can hold a few racks of ribs!!! Is the heat consistent like they are in the smaller kettles? The big kettle cooks just like all the other kettles. To keep the heat consistent on this kettle, I do like to run a fire on both sides of the kettle for the best results. It is a fun unit to use and I am always looking for something to cook on it. 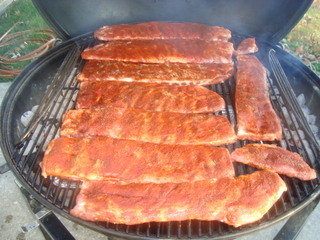 That kettle looks like it needs its own zip code Great looking ribs Dave. Damn, now that's a GRILL!